Sculpture in Stone (MFA), no. 363; Sculpture in Stone and Bronze (MFA), p. 115 (additional published references). 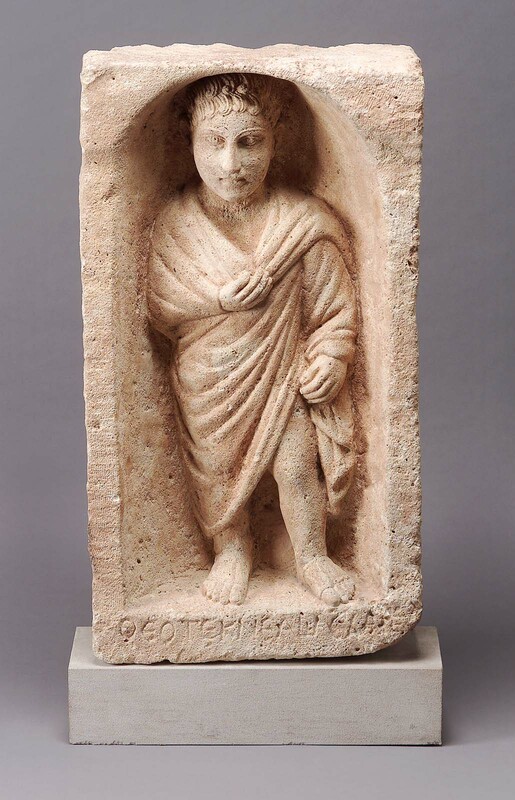 The young man wears a himation and stands facing in an oval to rectangular niche. His long face and large eyes, forerunners of East Greek art in Late Antiquity, give him a greater dignity and a greater age than is suggested by his chubby legs. An inscription appears on the bottom edge of the frame; the last five letters are uncertain: (add Greek). The young man with his fleshy legs and rubbery himation is thus unusual, all the more because of the serious contrast implicit in his large head, large almond eyes, and his long nose and chin. The edges of the naiskos are chipped and worn; the surface, which has yellowed, is somewhat pitted; otherwise the condition of the stele, which was once perhaps painted, is excellent.